Enjoy a wholesome family holiday experience ranging from natural scenery to local cultural activities over a great number of most popular tourist destinations in Central Japan. Make your way to bustling Osaka, Kyoto, Mt. 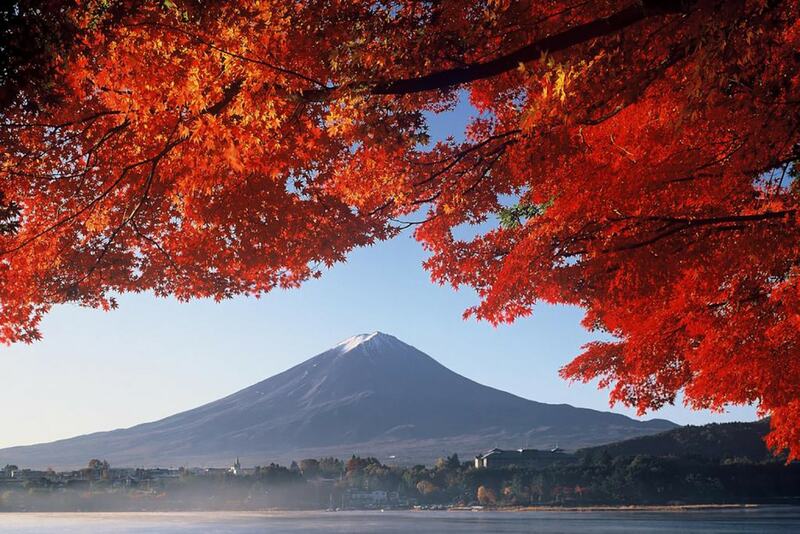 Fuji & Tokyo and be-awed with the panoramic view of Central Japan! Assemble at Home Country Airport for your flight to Osaka. Upon arrival, visit Wakayama Marina City, an amusement theme park with a spectrum of attractions appealing to all age groups, making it an altogether wholesome family entertainment experience. Visit Porto Europe, a theme park with a European flair that was modeled after a Mediterranean seaport. Proceed to Kuroshio Market within the park, the largest fisherman’s wharf serving a variety of seafood where you will witness a giant tuna cutting demonstration. You may savor fresh seafood at your own expense. Tonight, indulge in a relaxing Japanese hot spring bath at an Onsen Resort in Shirahama. A good rest is essential, for another day of thrills and spills await. This morning, visit Engetsu-jima Island, an uninhabited rock isle with a round sea cave in the center. View Sandan-beki, a 3-tiered wall with 60-metre-high precipitous cliffs extending approximately 2 kilometers from south to north. You may also capture the beautiful views of Senjojiki. This afternoon, make your way to bustling Osaka and walk it off in an enjoyable way by visiting Shinsaibashi Shopping Street, downtown Osaka’s major shopping belt to wrap up the day. Thereafter, proceed to your hotel. After breakfast, start your day with a history lesson at Osaka Castle. Regarded as a symbol of the city, the castle has been central to the rise and fall of the city’s fortunes through the years. Next up, hit the stores at Kobe Harborland and take in the panoramic views from the waterfront boardwalk. From there, ascent Kobe Nunobiki Herb Garden on ropeway, enjoy an airy ride in the sky up to the mountaintop and be-awed with the panoramic view of Kobe! Surrounded by flowers, the herb garden is ensconced in the mountain above the picturesque port city of Kobe, as one of the Japan’s largest herb gardens with about 75,000 herbs and flowers of about 200 kinds blooming throughout the year. What better way to end your day than to relax over a cup of sake? Learn about sake production and get to try freshly brewed sake at a Naka sake Museum, which has been producing high- quality sake thanks to the chilly winds of Mt Rokko and the perfect quality of the water in the region. Today, take a leisure drive to Kyoto, city of geishas, Zen gardens and temples, which charms with its understated elegance and refinement. Make a stop at one of the city’s cultural legacies, Kiyomizu-dera Temple. This distinctive Kyoto landmark features a wooden veranda that hangs over the valley, providing nice view of the numerous cherry and maple trees below that erupt in a sea of color in spring and fall, as well as a panoramic view of the city as you take in more than a thousand years of history. Next, visit Fushimi Inari Shrine and be awed with thousands of vermillion torii gates at the back of the shrine. The entrance to the torii gate is a trails lead into the wooded forest of the sacred Mount Inari, which stands at 233 meters and belongs to the shrine grounds, takes about 2 hours to complete the hike. Stop by Gion District lined with traditional wooden merchant houses, shop and restaurants. You might able to catch a glimpse of a maiko running errands. There is no better way to capture good views of Mt Fuji than a cruise ride along Lake Ashi, also known as Hakone Lake. Thereafter, make a stop at Gotemba Premium Outlets. Die hard shopaholics and stylist as will need an iron will and a steel-clad resolve to keep wallets in check, for a constellation of international brands and specialty stores housing the trendiest threads coverage here. Tonight, indulge in a relaxing onsen resort in the Mt Fuji region. After breakfast, proceed to visit the venerable Asakusa Kannon Temple, which has more than 1300 years of history. From here, you may catch a glimpse of the iconic Tokyo Skytree. Next, pick up souvenirs at nearby Nakamise shopping street, a walkway leading to the temple that is lined with crafts, souvenirs and other cultural curios. Browse and shop for the prefect keepsake for loved ones back home. Thereafter, make photo stops at Imperial Palace before you end the day with a shopping spree in Shinjuku, a sprawling district dotted with dazzling neon signs and sleek skyscrapers.